Have you printed your Summer Fun Checklist yet? There are 10 items on the checklist each month- June, July and August- with recommendations for activities to keep your kids active and engaged in the Austin community this summer. It's FREE, printable, and the kids can earn rewards all summer long when they complete 5 of the 10 items on the checklist each month! Listen to a storytime at BookPeople is one of the items on the checklist for the month of June! The article below originally appeared on FreeFuninAustin.com. 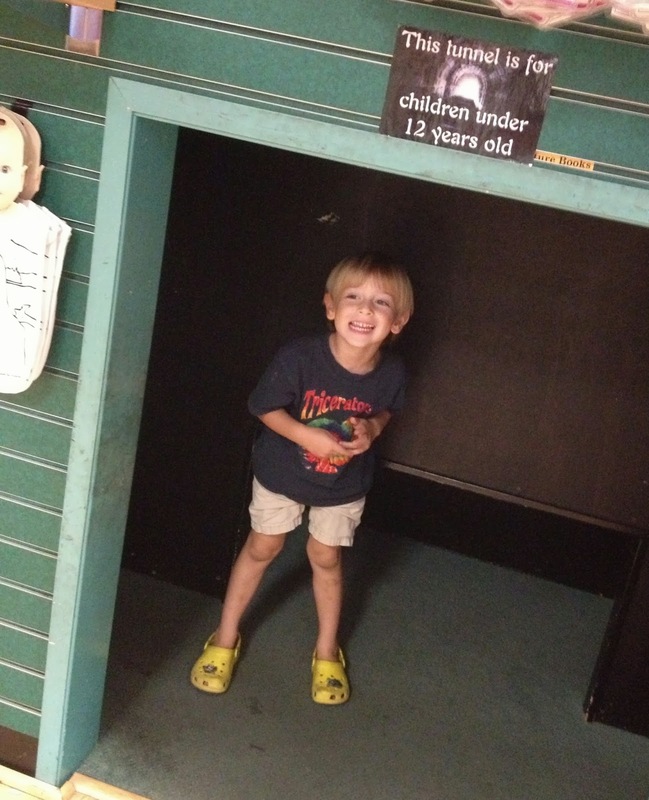 You can also count on your kids loving this place! Head upstairs to find the huge BookKids section. Besides a vast selection of children's titles, you can't miss the large storytime seating area with a small tunnel underneath. My kids just love climbing through that tunnel. 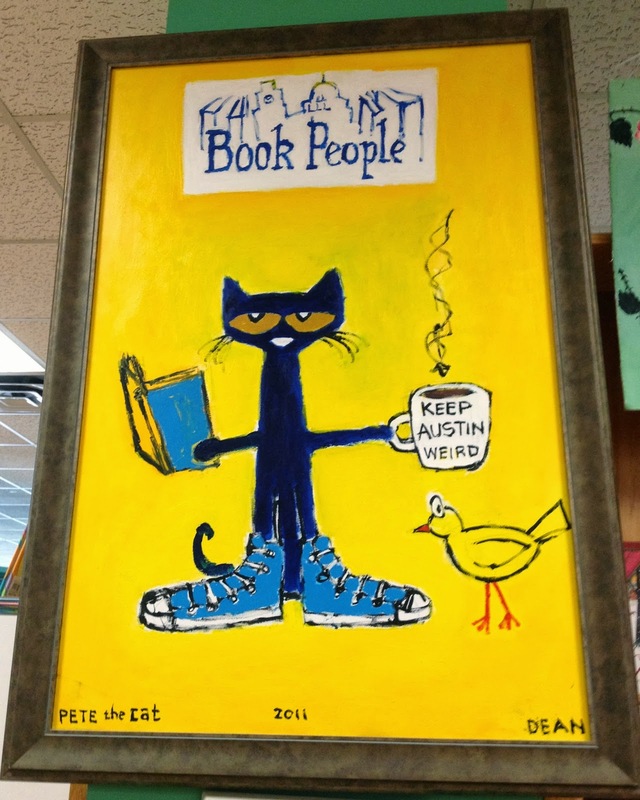 BookPeople offers a free storytime every Saturday at 11:30am. Throughout the week, there are events for children on Tuesday and Wednesday mornings at 10:30am. These weekday storytimes are often guest-hosted by local companies, such as Armstrong Community Music School or Tiny Tails Petting Zoo. Check out their event calendar for the latest offerings. Recently, I took my three boys to a storytime event. It was packed, and mostly full of babies and toddlers on that day. It's such nice location to meet friends, and all ages are welcome, so I can see why it's so appealing to the mom community. A member of the BookPeople staff stood and read loudly to the big crowd, but it was still a little too noisy for my oldest to hear the book. So I will remember that he needs to sit right up front next time if he's eager to be a good listener. After three books were read, the kids were given free cookies and coloring pages. My boys loved those treats at the end. In addition to the events, BookPeople also offers a free Birthday Club for kids. 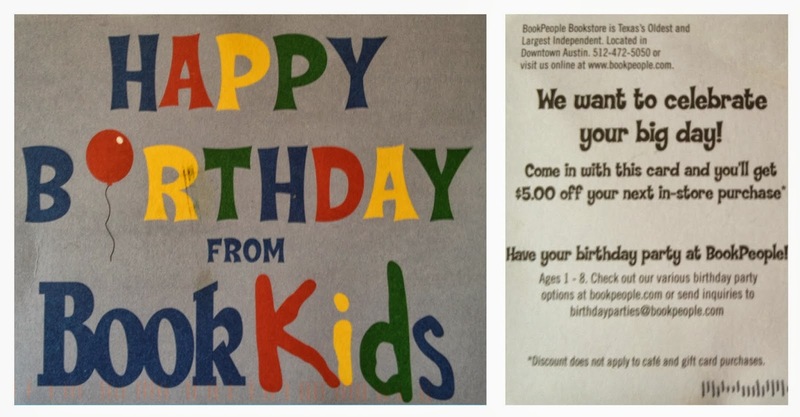 Parents can simply fill out a short form in the store, and BookPeople will mail a postcard to your child during his or her birth month for $5 to spend in the store. $5 for free? Yes, thank you! You may also be interested in a visit to Whole Foods Market. 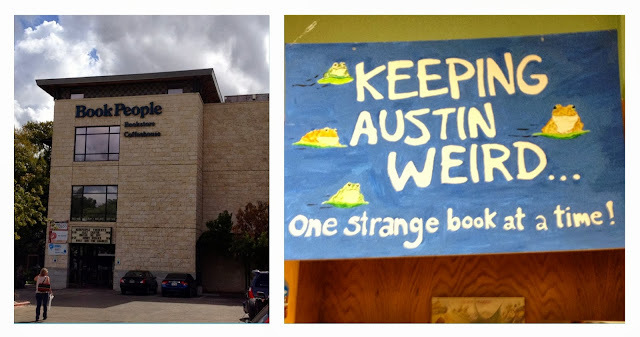 It's walking distance from BookPeople! Freelance web producer, Heidi Okla is mom to three boys (ages 3, 5, and 7), and can't pass up any opportunity for fun family adventures. Browse her literacy-focused kids activities on her blog, Read 'Em and Leap.